Cruz blasts Trump as 'an absolute disaster' during Republican Jewish Coalition meeting, warns of a GOP 'bloodbath'. Ted Cruz is making a play for Jewish Republicans, hoping to pick up support from donors and bundlers disaffected by Donald Trump’s statements on Israel and support from white supremacists like David Duke. 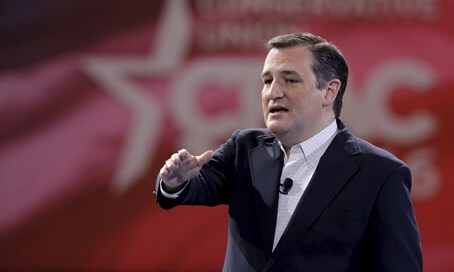 On Saturday the Texas Senator spoke at the annual meeting of the Republican Jewish Coalition in Las Vegas. Cruz warned listeners that nominating Trump would cripple the GOP and lead to an electoral “bloodbath”. “If Donald Trump is the nominee, it is an absolute disaster for Republicans, for conservatives, and for the country,” Cruz warned. Speaking to an audience of some 500 RJC members, Cruz was generally well received by the crowd. The RJC had invited all three remaining Republican candidates, but only Cruz made an appearance. Republican Jewish donors have had mixed feelings about Cruz, admiring his solid support of Israel, but worried about his electability in a general election. Ari Fleischer, who served as a press secretary for George W. Bush, articulated the anxiety some felt about the GOP presidential hopeful. But for some Republican Jews, Trump touched a raw nerve, a fact Cruz is counting on as he courts Jewish support. Charlie Spies, an RJC member, rejected the comparisons some on the left have made to Hitler, but admitted he found aspects of Trump’s campaign troubling. "No American politician should be compared to Hitler because of the unique, horrific nature of the Nazi genocide," he said. "Having said that, there is an issue of tone and being able to whip up crowds, often directed at segments of society that get scapegoated. Anybody who has studied history would be concerned watching that." According to a poll commissioned by the RJC, Trump came in dead last among Jewish voters, behind both Cruz and Ohio Governor John Kasich.